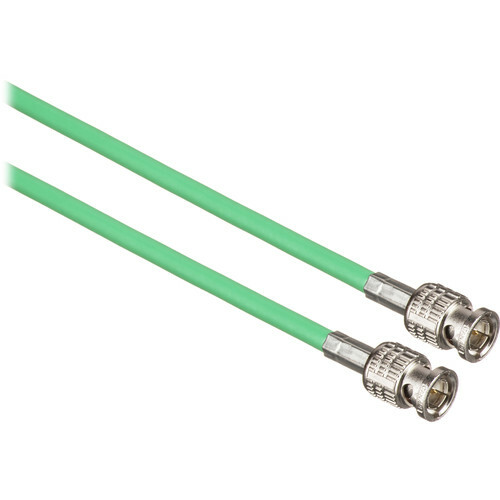 The Canare 25 ft HD-SDI Video Coaxial Cable - BNC to BNC Connectors (Green) is a precision serial digital video coaxial cable that offers throughput for HD-SDI video signals for professional broadcast applications. Thanks to dual copper braids that impart high flexibility and foam PE dielectric insulation, this RG6 coaxial cable can be bent around tight corners or run through tight spaces, while still providing a high-quality, low-loss transfer. Suitable for use in HD-serial digital video transfer, mobile applications, HDTV upgrades, broadband facilities, etc. Box Dimensions (LxWxH) 7.8 x 7.7 x 1.9"
25 ft HD-SDI Video Coaxial Cable (Green) is rated 5.0 out of 5 by 3. Rated 5 out of 5 by Billrat49 from I think Canare makes the best cables! These are high quality cables. Canare are the only HD-SDI cables I use. The BEST BNC connectors on the market and you can pick your color. Rated 5 out of 5 by Robert S. from nice flex and strong I wanted a cable to be flexable and have the proper ohms for my gear. This is it. Well made. I'm buying more of them. Rated 5 out of 5 by Jim from High quality cable We use this cable to send a feed from our camera to our video distribution system...works without issue.